NOW YOU CAN APPLY AN EPOXY COATING OVER JUST ABOUT ANYTHING! COAT-ALL LET'S YOU EPOXY PAINT ANYTHING! Our Adaptive Molecular Technology Lets You Paint Over Wood, Ceramic Tiles, VCT Tiles, Rubber, Metal And More! It lets you put an epoxy paint coating on just about any indoor surface. It also lets you put on a UV rated epoxy coating over just about any outdoor surface. This kit lets you cover old ceramic, VCT or porcelain tiles including their ugly seams and grout lines. Do you have slippery old tiles outside, epoxy coat them with a UV rated durable textured coating. If you have any surface that you keep painting every year or can't afford to replace this is your answer. Coat-All Epoxy can save you thousands of dollars in replacement costs! Works on all metal surfaces such as steel, iron, aluminum(coated or uncoated) and galvanized. Metal surfaces must be free of oil and rust prior to coating. For metal surfaces that need rust inhibiting protection use a paint compatible rust inhibiting primer first that has a high zinc content. For wood floors, rough sand your floor to get it clean and roughed up first. If your wood floor has a lot of deflection purchase the flexible indoor epoxy version. Same goes for precast concrete floors which tend to have a lot of deflection in them. Please note that indoor and out door colors are different due to the UV rating of the outdoor version, see the two separate color charts. FOR COLOR CHARTS AND TO ORDER CLICK ON IMAGES AT TOP OF PAGE. DUE TO THE HIGH DEMAND FOR THIS PRODUCT WE ARE EXPERIENCING SHIPPING DELAYS OF 4-5 DAYS. Application is simple. Clean surface well, roughen up with sand paper as much as possible. Use floor buffer with black pad on floor tiles for best results. Apply special white primer and allow to dry 24 hrs. Then apply epoxy coating or outdoor coating. Outdoor coating requires two coats over primer. Not rated for vehicle traffic. 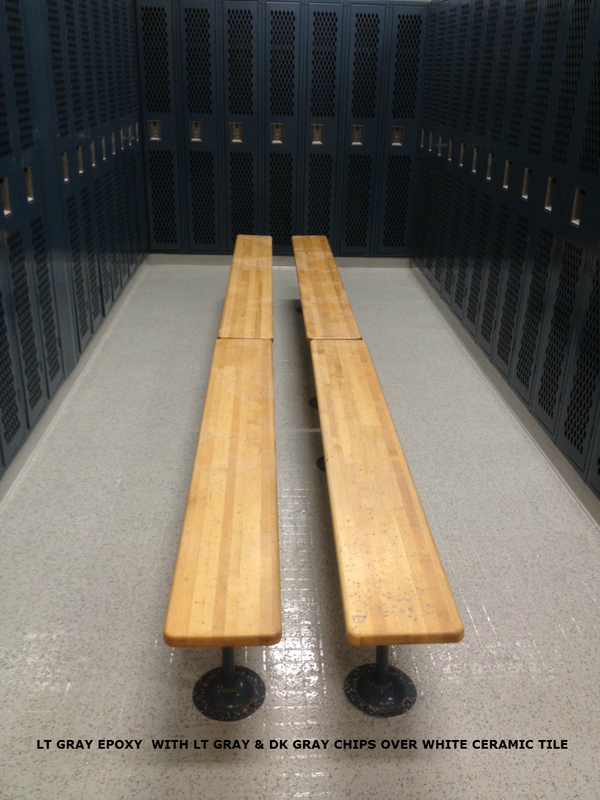 To fill in indoor grout lines completely allow for at least 50% more product depending on depth of grout lines, for a finish like the ceramic tile in the locker room below add about 20% to your actual square footage to get the right quantity of kits you will need. For finish like below simply roll on a nice thick coat and let the epoxy self level and cure. For completely hiding the grout lines first use a flat squeegee to spread epoxy over the primed tiles into grout joints, leaving very little epoxy on the tile surface but mostly filling in the grout lines. Allow to dry then roller on epoxy coating over grout joints and tile surface to completely cover the grout lines and primed tile surface. Or you can fill in grout lines with a cement patch and then just apply coating as normal. For VCT Tile seams allow an additional 20% material. We recommend two coats of Bonding Primer for VCT Tile. See Bonding Primer at bottom of main page for additional purchase. For heavily trafficked floors we recommend the application of the topcoat. This provides added protection against shopping cart wheels, toys, large customer volumes etc.